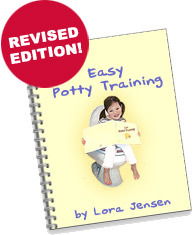 The great success of having your child potty trained is amazing. She uses the potty regularly and accidents are almost a distant memory - although not entirely. She really isn't interested in wearing diapers at all anymore and you're reticent to put them on to take her out because you don't want to encourage regression. You muster your courage and decide to take her out shopping with you and plan a great day together. While you're in the store she announces she has to go potty - right now. You abandon the buggy and run for the bathroom. You have her over the toilet only to hear the words you dread - "I don't like this potty. I can't go. I want my potty." Sound familiar? So much focus is placed on potty training at home, you often forget there will be times when your children will have to use a public bathroom. You will definitely be taking them outside of home at some point without diapers. Training for this adventure need not be painstakingly long. If your child is potty trained at home, then you should be able to help your child overcome the fear and discomfort of using a public bathroom relatively quickly. Below are some suggestions to help the transition along. First of all, make a final trip to the bathroom at home mandatory. This is not up for discussion or bargaining. When your child knows that you are not leaving the house until they've made a trip to the bathroom, it becomes part of the routine, expected and fulfilled. Don't rush them. Take whatever time is necessary to ensure they've gone - you'll save yourself a lot of grief later. If you're headed to the mall, check out the location of the bathrooms when you arrive. It's always good to know where to run to in an emergency. Public bathrooms can be daunting for a small child. The automatic flushes on many of them can catch the child off guard and frighten them, making using the toilet a fruitless effort. If there's a sensor that flushes the toilet, cover it with your hand. If your child is accustomed to flushing the toilet at home, then this process will probably be less intimidating, however the loud noise which echoes in the stall may put them off. Let the child flush the public toilet themselves a few time to become familiar with the sound, making a bit of a game of it if there's a sensor. If your child remains intimidated, work through the fear as you would any other fear and help them overcome it. What about those ghastly toilets at the park? So many are hopelessly dirty and smelly. There are few different ways to deal with this. You can pack the potty chair in the car and use it when you know you're going to the park, or you can purchase a plastic seat cover for the toilet which will become familiar to her. If you've taught your child the fine art of using the great outdoors, then this is another option. By treating the condition of park outhouses as matter-of-fact, your child understands that these toilets are this way and that's all there is to it. Just be sure you've got plenty of wipes, hand disinfectant and tissues with you to ensure proper cleanup.